Nancy Meisenger advocates her seven qualities of instructional coaches necessary to support the implementation of personalized learning. "Personalized learning is not a free-for-all, it's actually very intentional. 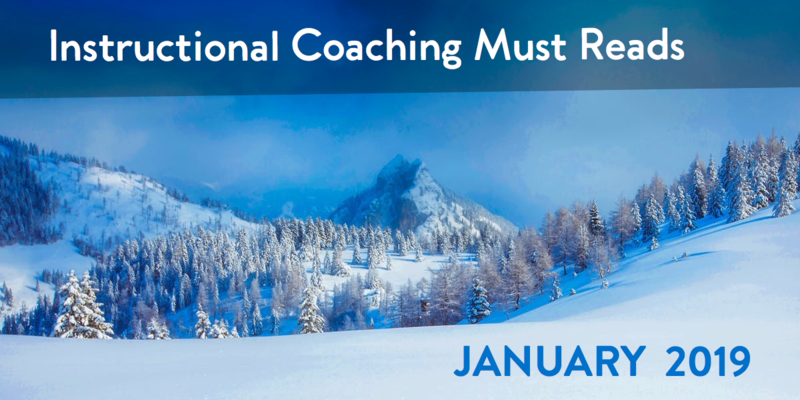 As a coach, we must help teachers understand that they can determine where and when this personalization can occur. . . . Often times we are offering food for thought and they will come back later once they have had a chance to digest our conversation." Vicky Collet compares two types of questioning techniques—funneling and focusing—and how each one can support coaching conversations. "A focusing pattern of questioning will center on the teacher's contributions. You listen to the teacher and consider her responses, asking follow-up questions that center on these ideas. The result is a conversation built on your expectation that the teacher now has the experience to think strategically about how to use the new approach. Focusing questions demonstrate your respect for the teacher's ideas." Jennifer Wood shares ideas for goals during coaching cycles and guiding questions to support creating your own coaching checklist when working with teachers. "I like to use questions that focus on the teacher to help them reflect on what's currently happening to further understanding. . . . When thinking of your own checklists of guiding questions to use with your coachees, it can't hurt to make sure these things are all in place. As a bonus, the conversations may be enriching, helping you to better know and connect with the teacher you are partnering with! Building quality relationships with teachers is key to successful instructional coaching! Coaches cite relationships as one of the most time-intensive parts of their job, and it takes a lot to get it right. TeachBoost Coach helps you build and reinforce the relationships that will create instructional shifts in the classroom. Liz Russillo reflects on her experience working with a coach, being a coach, and creating coaching partnerships where everyone benefits. "The best part about instructional coaches is that they exist in our schools. They are the other veteran teachers next door or down the hall who have a different skill set than our own. We need to break down the walls between our classrooms . . . and start coaching each other." Dana Kramaroff shares a few of her frequently used open-ended questions during her coaching sessions to both help teachers expand on their responses and promote self-reflecting learning. "My goal is to begin open-ended conversations that push teachers to think and reflect. Listening and allowing them to do the talking is key to growing trust. . . . The job of the coach is not to give all the answers but to guide teachers to find the answers on their own." Steve Barkley compares three coaching approaches (performance, development, and transformative) and examples of each approach. "The initial implementation of a new skill tends to create a decrease in teacher effectiveness. This clumsy, somewhat jerky execution feels uncomfortable to the teacher and often confusing to students as it requires a change in their learning behaviors. Coaches' encouragement and observations of progress promote the necessary practice repetitions. . . . I keep in mind and repeat in trainings that I want to know what the teacher thinks, before I share my thinking."